Bill Jennings, executive director of the California Sportfishing Protection Alliance (CSPA), described the Bay Delta Conservation Plan to build the peripheral tunnels as “ a desperate scheme to perpetuate an unsustainable status quo that enriches a few powerful water brokers at the expense of reliable water supplies, Delta communities and healthy fisheries." 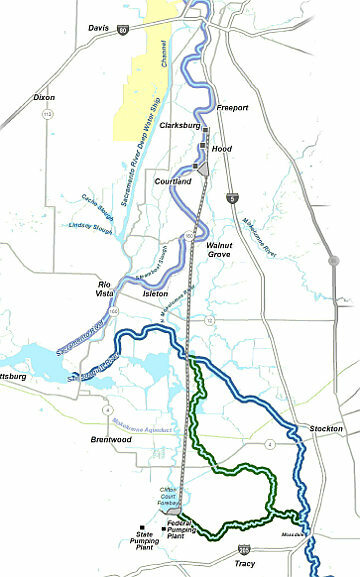 The Brown administration has constantly touted the Bay Delta Conservation Plan (BDCP) to build the peripheral tunnels as a visionary, ambitious project to accomplish the "co-equal goals" of "ecosystem restoration" and "water supply reliability," while tunnel opponents say the project will actually lead to the death of the Sacramento-San Joaquin River Delta. In an effort to dramatize the impact of the tunnels on the Delta, a coalition of environmentalists, fishermen and family farmers opposed to Governor Jerry Brown’s plan to build the twin tunnels held a “Death of the Delta” funeral and press conference before a public meeting of the Bay Delta Conservation Plan began at the Woodlake Inn in Sacramento on April 4. 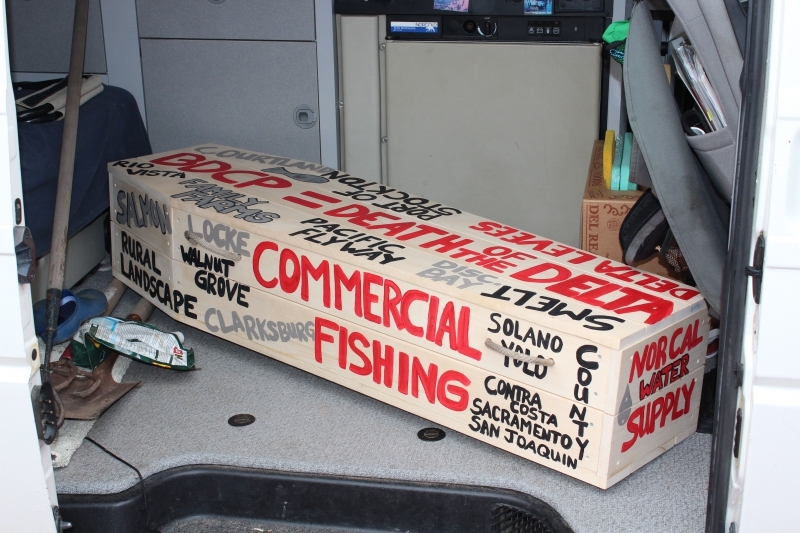 The centerpiece of the Restore the Delta event was a coffin emblazoned with names of the victims of the project if Brown’s plan’s goes through. They included “NorCal Water Supply,” “SF Bay Water Quailty,” “Delta Smelt,” Salmon,” “Orcas,” “Port of Stockton,” “Port of Sacramento,” Family Farms,” “Pacific Flyway,” “Rural Landscape” and a list of Delta towns and cities. Delta advocates fear the construction of the tunnels will lead to the extinction of Central Valley chinook salmon, steelhead, Delta smelt and other imperiled fish species that have declined dramatically, due to massive water exports to corporate agribusiness, the oil industry and Southern California water agencies. Bill Jennings, executive director of the California Sportfishing Protection Alliance (CSPA), described the Bay Delta Conservation Plan to build the peripheral tunnels as “a desperate scheme to perpetuate an unsustainable status quo that enriches a few powerful water brokers at the expense of reliable water supplies, Delta communities and healthy fisheries." 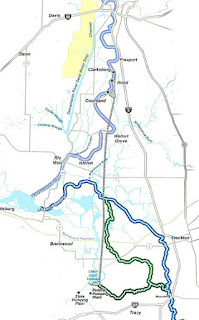 Jennings said the BDCP ignores the facts that the legal rights to divert Central Valley water exceed actual water five-fold – that’s 153.9 million acre feet of consumptive rights to divert 30 MAF of average unimpaired flows. “That’s why it rejects a water availability analysis – because the majority of northern California water rights are senior to export rights,” he said. “At its heart, BDCP is a backdoor attack on 150 years of Califronia water rights law." Jennings also said BDCP ignores the fact the State Water Resources Board has already concluded that Delta outflows must be significantly increased in order to protect the public trust resources of the Delta. “It rejected an analysis of how much water the estuary needs in order to survive as a functioning ecosystem – because increased outflow translates to reduced exports," he said. Tunnel sacrifices family farmers at "altar of greed"
Clarksburg farmer Steve Heringer said his farm would be "sacrificed at the altar of greed" under the governor’s tunnels plan. "My family has grown tomatoes, corn, forage and grape crops in the Delta for six generations, and we plan to do so for many more,” said Heringer. “The State intends to ruin my family’s land to benefit mega-farms growing permanent crops on arid lands. That makes no sense." Barbara Barrigan-Parrilla, Executive Director of Restore the Delta, summed up the destructive impact of the tunnels when she stated, "The Peripheral Tunnels will kill the Delta, SF Bay/Delta fisheries and Delta farms. We call upon the governor to abandon this flawed project that was rejected by California voters in 1982." In contrast with the false claims of agribusiness Astroturf groups that the west side corporate growers “feed America,” she said two-thirds of Delta water exports go to support on 0.3-0.4% of the California economy (GDP) on the west side of the San Joaquin Valley. Less than a third goes to areas representing two-thirds of the state’s population and economy. "Why would the State choose to sacrifice sustainable family farms on prime farmland in the Delta in order to send subsidized water to grow subsidized crops on the impaired soils of west side plantations, whose owners live in Pacific Heights and Beverly Hills?" asked Barrigan-Parrilla. "The ‘tunnels’ represent nothing more than simply a transfer of good quality water around the Delta. They also represent the largest transfer of wealth in our history." "BDCP is rigging a cost-benefit analysis of the proposal by refusing to include alternatives, and excluding some costs that would fall on water ratepayers. How much will rates need to increase if this project moves forward?" Barrigan-Parrilla said. “We cannot find one river system that’s ever been restored by having its water removed from it,” concluded Barrigan-Parrilla. Barrigan-Parrilla's last statement expresses similar sentiments to two questions I asked Jerry Meral, the Deputy Director of the Natural Resources Agency, at the BDCP public meeting in Sacramento on March 20. First, can you give me one example in U.S. or world history of where the construction of a diversion canal or tunnel has led to taking less water, rather than more water, out of an ecosystem? Second, can you give me one example in U.S. or world history where the construction of a diversion canal or tunnel has led to the restoration of an ecosystem? Meral and his advisers couldn't answer these question because they know that the construction of the tunnels will ultimately lead to more water being taken out of an ecosystem, not less, and to the ultimate destruction of the ecosystem. The rush to build the peripheral canal is not the only abysmal Schwarzenegger administration policy that the Brown administration has continued and expanded. Brown and Natural Resources Secretary John Laird continued the privately-funded Marine Life Protection Act (MLPA) Initiative started by Governor Schwarzenegger in 2004. The Natural Resources Agency and Department of Fish and Wildlife have issued press release after press release failing to mention the conflicts of interest, failure to comprehensively protect the ocean, shadowy private funding and incomplete and terminally flawed science that have made the MLPA Initiative to create so-called “marine proected areas into one of the most sickening examples of corporate greenwashing in California history. The Brown administration also authorized the export of record water amounts of water from the Delta under the Brown administration in 2011 – 6,520,000 acre-feet, 217,000 acre feet more than the previous record of 6,303,000 acre feet set in 2005 under the Schwarzenegger administration. Other environmental policies of the Schwarzenegger administration that Brown and Laird have continued include engineering the collapse of six Delta fish populations by pumping massive quantities of water out of the Delta; presiding over the annual stranding of endangered coho salmon on the Scott and Shasta rivers; clear cutting forests in the Sierra Nevada; supporting legislation weakening the California Environmental Water Quality Act (CEQA); and embracing the corruption and conflicts of interests that infest California environmental processes and government bodies ranging from the Bay Delta Conservation Plan to the regional water boards.